This is my latest project. 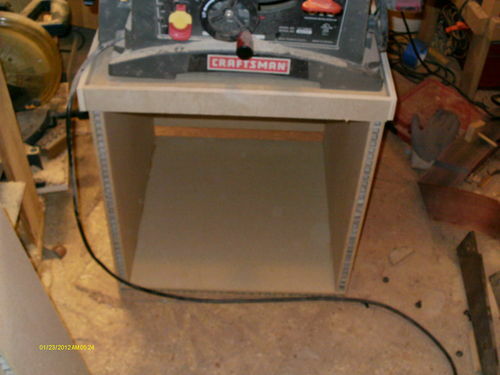 Table saw cabinet that was very much needed. I am going to be putting finishing touches on it. Thank you to Tyskvinna for the MDF. Looks good, to get the saw up in work hight. Another useful addition to the shop. Good job. Very nice, I like the beading down the front sides…. -- Chrisy & Larry GR. MI. Actually the beading is honey comb cardboard sitting between sheets of MDF. I am going to put some trim around it to cover that up. Jim it may just be a glitch on your end try again. or reload. Sometimes I need to do that to get the page to load correctly.